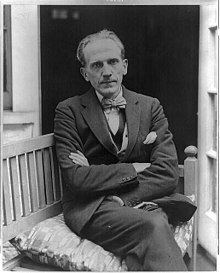 Alan Alexander Milne (18 January 1882 – 31 January 1956) was an English author, best known for his books about the teddy bear Winnie-the-Pooh and for various children's poems. You mustn't go down to the end of the town if you don't go down with me. I can go right down to the end of the town and be back in time for tea! "If there's a buzzing-noise, somebody's making a buzzing-noise, and the only reason for making a buzzing-noise that I know of is because you're a bee." And then he got up, and said: "And the only reason for making honey is so I can eat it." So he began to climb the tree. Pooh always liked a little something at eleven o'clock in the morning, and he was very glad to see Rabbit getting out the plates and mugs; and when Rabbit said, "Honey or condensed milk with your bread?" he was so excited that he said, "Both," and then, so as not to seem greedy, he added, "But don't bother about the bread, please." "I'm giving this to Eeyore," he explained, "as a present. What are you going to give?" "Couldn't I give it too?" said Piglet. "From both of us?" "No," said Pooh. "That would not be a good plan." It was just as if somebody inside him were saying, "Now then, Pooh, time for a little something." Kanga said to Roo, "Drink up your milk first, dear, and talk afterwards." So Roo, who was drinking his milk, tried to say that he could do both at once . . . and had to be patted on the back and dried for quite a long time afterwards. "Not very how", he said. "I don't seem to have felt at all how for a long time." "Good morning, Pooh Bear", said Eeyore gloomily. "If it is a good morning", he said. "Which I doubt", said he. There are some people who begin the Zoo at the beginning, called WAYIN, and walk as quickly as they can past every cage until they get to the one called WAYOUT, but the nicest people go straight to the animal they love the most, and stay there. Forgiven (affectionately also known as Alexander Beetle). One day when Pooh was thinking, he thought he would go and see Eeyore, because he hadn't seen him since yesterday. Now it happened that Kanga had felt rather motherly that morning, and Wanting to Count Things — like Roo's vests, and how many pieces of soap there were left, and the two clean spots in Tigger's feeder. "And he respects Owl, because you can't help respecting anyone who can spell Tuesday, even if he doesn't spell it right; but spelling isn't everything. There are days when spelling Tuesday simply doesn't count." Chapter Five - Rabbit, speaking of Christopher Robin. Chapter Six - "In which Pooh invents a new game and Eeyore joins in". "No," said Pooh humbly, "there isn't. But there was going to be when I began it. It's just that something happened to it on the way." "I'm not going to do just nothing anymore." "I shouldn't be surprised if it hailed a good deal tomorrow", Eeyore was saying. "Blizzards and what-not. Being fine today doesn't mean anything. It has no sig - what's that word? Well, it has none of that. It's just a small piece of weather." If I plant a honeycomb outside my house, then it will grow up into a beehive. Then Christopher Robin and Winnie the Pooh walked hand in hand down the forest path and they said goodbye. So they went off together. But wherever they go, and whatever happens to them on the way, in that enchanted place on the top of the forest a little boy and his bear will always be playing. "That's what Jagulars always do", said Pooh, much interested. "They call 'Help! Help!' and then when you look up, they drop on you." "They wanted to come in after the pounds", explained Pooh, "so I let them. It's the best way to write poetry, letting things come". I love kids’ fantasy...everything from L. Frank Baum to A. A. Milne … Narnia to Wonderland to Neverland. These are magical stories that nurtured me as a child and then nurtured my own children, as well. What better legacy could a writer have than to continue that wonderful tradition of imagination and insight and adventure? J. M. DeMatteis, in Interview at "A Conversation With The Legendary J.M. DeMatteis!" at TheComicFanatic.com (9 December 2004). Dorothy Parker, in her "Constant Reader" book review of The House at Pooh Corner in The New Yorker (20 October 1928).